An organized and clean patio area is encouraging to be around and work in. While a hose is a vital gardening equipment, it can make the whole place look as if it could do with some work especially when it gets tangled and all soiled up. The following are some of the best garden hose reels that will make your gardening space look organized and easy to work in. The flexible garden hose is a critical piece of equipment that makes access and use of water for various activities easier. To prevent it from getting all tangled up and other associated problems, you need a hose reel. The hose reel allows you to coil the watering hose into a fuss-free and neat coil – this saves a considerable amount of time and frustration. With a hose reel, your water hose can stay long enough despite the continued use. The gardening hose has without a doubt many applications. You will use it to clean the vehicle and drag it to your vegetable garden. The hose reel provides adequate protection from the elements so that it stays for longer. The piece of equipment also protects your garden. Leaving the hose lying around on the lawn is not good as it will likely leave indents and possibly kill it too. Indents are just as bad as tire depressions and should be avoided at all costs. There are several types of hose reels, and your choice should depend on some factors such as affordability, available space to mount it and the appeal – this varies between users. The stationary hose provides functional storage space for hoses. They make retrieval so much easier that you don’t have to deal with untidy knots. The hose reel carts are the portable varieties for those that use a hose on different parts of their garden for watering. This variety has a wheel or wheels making it easier for you to move them. They also keep the hose to remove tripping risks. Wall-mounted reels are some of the most common, and you have probably come across some of them. Ideally, they should be strong and tight enough to stay in place – it should not sag under the weight of the hose reel and should not become wobbly. The automatic hose reel makes winding easier that you don’t need to keep turning the wheel. They are efficient and make your task easier. Both are equally important. The longer the distance, the longer the hose you will need to fulfill your water needs. This would mean you need a hose to accommodate the length without any strain comfortably. The best one should also not bulk under the weight of the hose. Measure the length up to the furthest point you need it and then decide on that basis. Durability is a critical factor that you should look for in every product you purchase – no one wants something that will disintegrate within a short period. If you are looking for a hose reel to use on a daily basis, then consider rugged material to withstand the strains and stress of continuous use. The reel also needs to be weather resistant so it can be left outside. For this reason, being rust-resilient is also essential. Keep in mind you may need to also move it inside during the winter. Some products on the market are designed with a plastic structure for better protection. Whether a Hose Reel is portable or not may all be down to preference and the need for convenience. If you have an expansive piece of garden, then a compact hose reel is better. It will save you the hassle of having to bear the weight of the hose all around the garden. If you want a non-portable hose reel, then you are going to need a product that will easily withstand the stress of being pulled about – it should securely attach to the wall, and all its fixtures should be sturdy. This is another convenient feature you may decide to have. These are especially useful if you have a big garden you need to water. The retractable hose reel makes your task much easier. But this is when rolling it back. Pulling it to where you need it may prove quite a task. Each product comes with several other fittings and attachments to help mount the reel or set it up and start using. However, some accessories may be what you need to make your watering task easier. For example, a spray nozzle that you can quickly turn the water on and off will make all the difference. It can make it easy for you and so is a good idea to invest in it. Your primary goal is to get a durable hose reel that will withstand the abuse that characterizes constant use. And with this product, you can be assured of quality and durability. Its base and guide arm are all steel for durability and strength. The product also has a practical swivel that makes pulling and winding quite a breeze. Some of us want something that is easy to handle in terms of rewind. If the hose is considerably big, then you may spend an eternity trying to get it together. This hose reel has an automatic rewind system for easier rewind – you do it within the shortest time possible. It is fully assembled, and all you need to do is unpack and use it as necessary. The hose reel is tangle-free which is quite convenient for you- no dealing with time-wasting rolling and untangling. 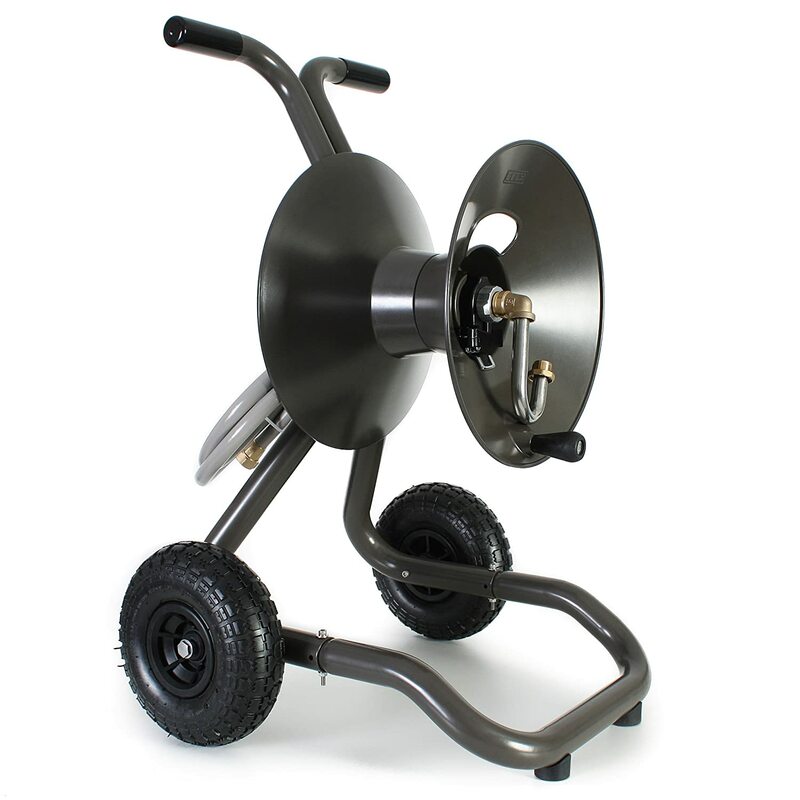 If you have a big garden or place that needs watering or you have several water taps scattered in your yard, then this hose reel cart may be what you need. 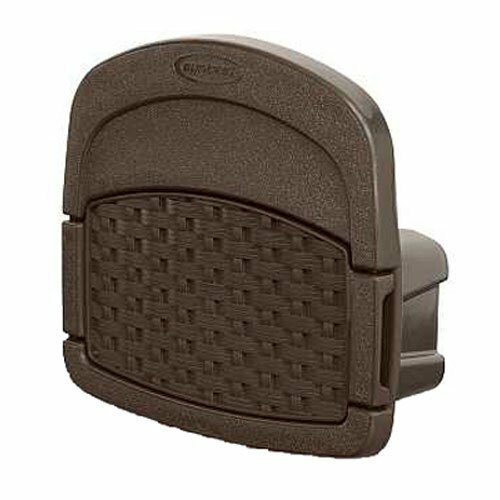 It has an attractive design of die-cast aluminum and is compact for more natural movement. The hose reel is also smooth to use that anyone can unwind and rewind it. This is a well-designed hose reel that may look attractive on any wall. And to make it easy for you, the hose reel comes fully assembled – you will not be surprised when you find some missing parts. 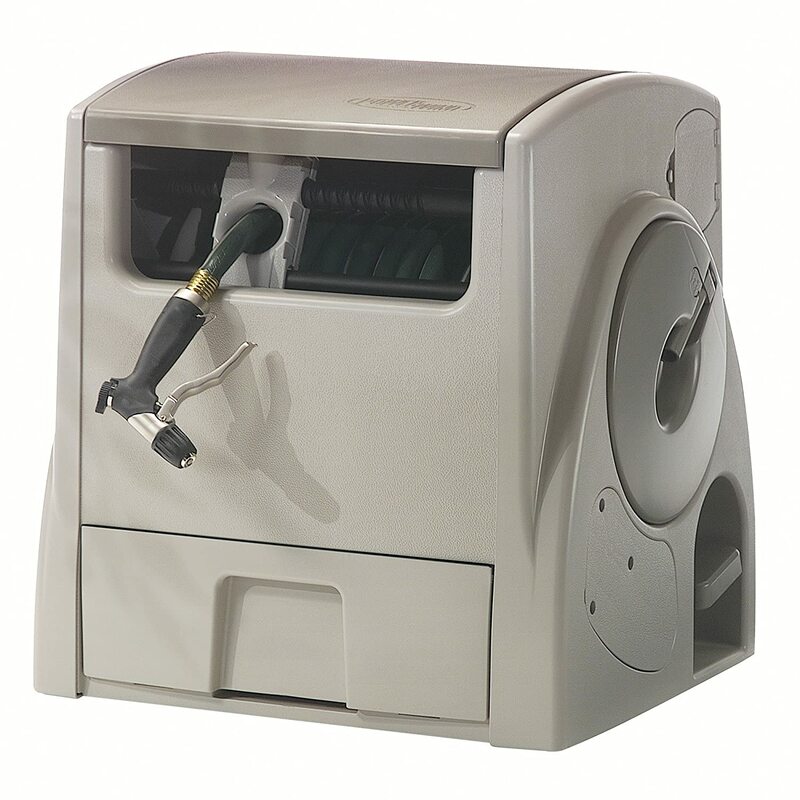 The hose reel attaches securely to the wall providing a stable base for all your activities. The product is well enclosed to provide adequate protection to the hose. That means it will not be rained or suffer under the harshness of the elements – this is what a good quality hose should do. The design of this hose screams simplicity onto your face the moment you lay your eyes on it. 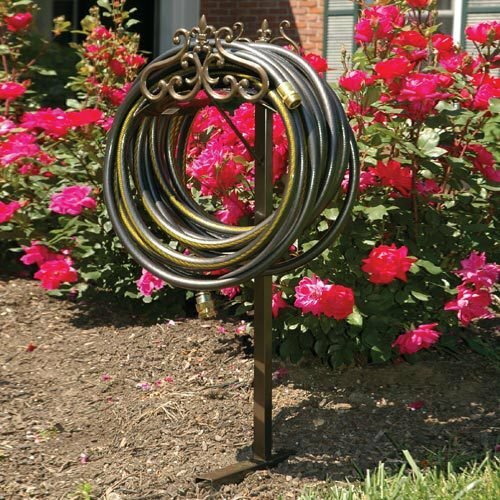 The hose reel has an attractive bronze finish and is an excellent addition to any garden or patio. It is made of powder-coated steel for durability. The product is water and rust resistant making it perfect for your outdoor space. The hose reel has a footrest and drive spike making it easy to install. The best garden hose reel makes your task of watering your or washing quite easy. Therefore, convenience is a critical factor when it comes to hose reels. The above products are easy to use and underscore a certain level of attractiveness. 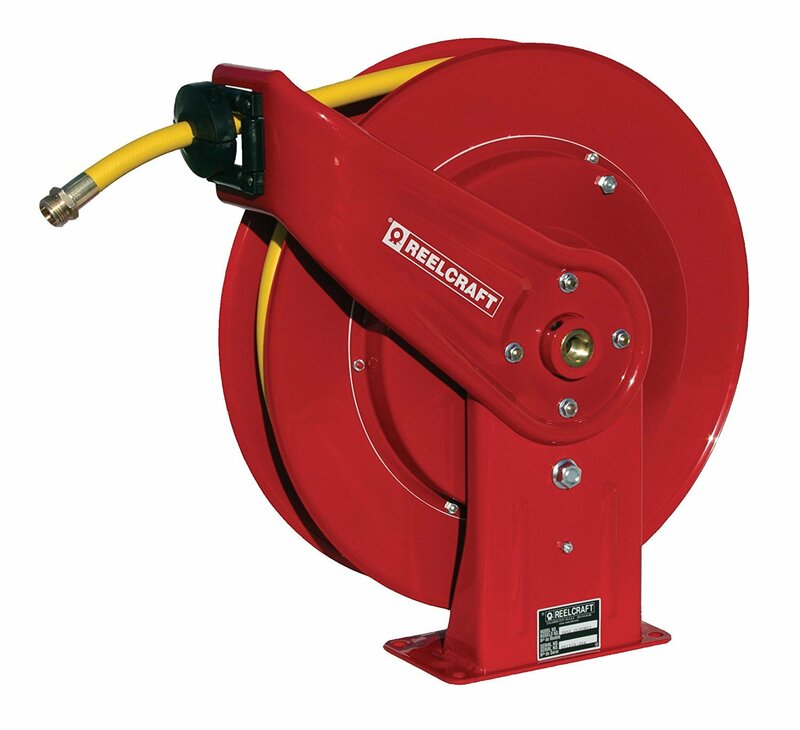 However, our top choice for this review is the Reelcraft 7850 OLPSW57 Spring Driven Garden Hose Reel. The hose reel has an efficient swivel, durable quality material and excellent finish to protect the hose from the elements.